When invasion looms… Tamas’s invasion of Kez ends in disaster when a Kez counter-offensive leaves him cut off behind enemy lines with only a fraction of his army, no supplies, and no hope of reinforcements. Drastically outnumbered and pursued by the enemy’s best, he must lead his men on a reckless march through northern Kez to safety, and back over the mountains so that he can defend his country from an angry god, Kresimir. I read the first of the Powder Mage trilogy earlier in the year and enjoyed it. I have to say that The Crimson Crusade was even better. 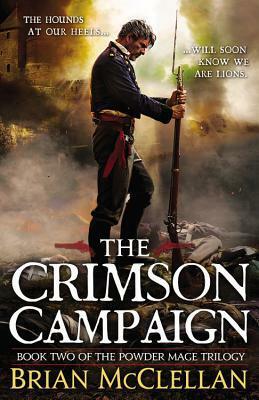 The Crimson Campaign puts us right back in the story where Promise of Blood left off. Tamas is in an enemy land working his way home. Adamat’s wife and children are being held by Lord Vetas. Taniel is “recovering” from the final events. Nila is still trying to protect her young charge and is being held by Lord Vetas. I love this world and these characters! But it’s hard to review. It’s the second book and you really do need to read the first one before it or you’ll be lost. It keeps building, the action is virtually non-stop and everyone I like was in danger at some point. Okay, there are probably a couple of exceptions to that statement, because there are a couple of characters with more power than we realize, I think. It’s one of those books that I get so wrapped up in, I just need to know what happens next. It’s a hard to book to review though. The audiobook is 20 hours long with something going on every minute. We’ve got four points of view: Tamas, Adamat, Taniel, and Nila all with a piece of the story. For me, this time around, it was Tamas and Taniel who caught my attention, one behind enemy lines, one at the front. Tamas is committed, although I hate to say one revelation was a little disappointing, but in character, if that makes sense. Taniel is a talented powder mage and his partner Kar-Poel, a foreign sorceress, are just an awesome pair. I’m thinking Nila might get a bit more interesting in the third book, because her character is developing along different lines than I expected. Up to now, she’s been the protector of the heir to the throne if there was still a throne. We know she’s a strong, resourceful young woman, but she’s got some surprises in her. Christian Rodska does an excellent job, for the most part. For me, he fits Tamas’ point of view best, he sounds like I picture him, a bit weary, with a rather dark sense of humor. Rodska’s tones and inflections really bring out the thoughts behind the dialogue. There were a couple of characters that I didn’t really like his voices for, but that’s just me, they didn’t seem right to me, you might disagree. All things considered, with so many characters, and it is a huge list when you think about it, he keeps them all separate and identifiable. I have a couple of minor quibbles. I like books, even in series, to be mostly self-contained and this simply wasn’t. It’s clearly a middle book, with no real beginning or end. The other thing is McClellan’s tendency to switch points of view right at major turning points, leaving us with mini-cliffhangers throughout the book. Yes, it wants you to keep reading/listening, but it gets a little annoying. How about a couple of quotes? “You missed the morning’s festivities,” Bo said to Adamat. “You call torturing a man ‘festivities’?” Adamat asked. And the quote on the front cover, “The hounds at our heels will soon know we are lions,” made me think- yeah, that’s why I love military fantasy. It’s a rousing speech that can only be pulled off for military campaigns. This is just a great book, and I can’t wait ’til next year when the final bit comes out. I’m assuming the good guys will win, but McClellan has a way of leading me down roads I’m not expecting, of throwing in complications or outcomes I didn’t see coming. It’s one of the reasons I’m hooked. You did a good job with it! Reviewing any audio would make me crazy! I know right, so good!!! Great review. I’m not familiar with this series or author. Love that cover though! I bet this would be great on audio. Glad you enjoyed it! This is now the second review I’ve seen for this. I’m going to have to get a hold of the first book in the series.